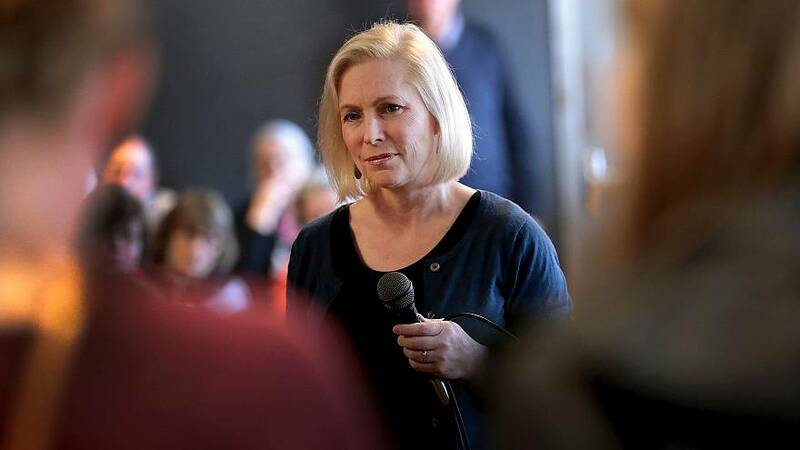 Sen. Kirsten Gillibrand, D-N.Y., officially launched her presidential campaign on Sunday with a speech outside the Trump International Hotel and Tower in New York City, saying she wants voters to know that no one in the Senate has done more than she to fight President Donald Trump. "I'm proud to have stood up to Donald Trump more than anyone else in the Senate," she said, according to prepared remarks. "I've fought against his ban on transgender service members in our military and the inhumane unacceptable treatment of asylum seekers at our border. I have confronted the corruption of this administration by opposing unqualified Cabinet nominees and extremist judges who would extend Trump's harmful ideology for generations to come." "I will go toe-to-toe with anyone to do the right thing, whether it's powerful institutions, the president, or even my own party," Gillibrand continued. "But I'm not running for president because of who I'm fighting against. I'm running for president because of who I'm fighting for." The two-term senator launched an exploratory presidential committeein January, but so far, she has not taken off in the polls despite being one of the more prominent members of Congress running for the Democratic Party's 2020 nomination. "That's not what we deserve — not what you deserve," the senator continued. "We need a president who is brave — a president who will walk through fire to do what's right, making Americans' lives better." Gillibrand also pointed to the Trump building she was speaking in front of as "a shrine to greed, division and vanity.